Convert YouTube video to MP3, MP4 and other 1000+ video/audio formats. Transfer converted video/audio file to Android/iOS device, external hard drive, etc. For phone users, especially on the Android OS, there are many applications that can do the MP3 conversion. But, not all pass through the process of reliability, quality, size, format, and performance. So how can we get the best MP3 converter app or which one to choose for video/audio to MP3 conversion is this your concern? Have a look over the detailed information that outlined some of the best MP3 Android converters. This is a smart MP3 converter for Android designed by Keerby Applications. The application, MP3 Converter for Android specifications are awesome. It supports conversion to different file formats. During conversion, one can change the frequency, bitrate or even channel and start time and duration of the format output. It also supports the ability to change audio volume. The application is easy to use and comes with a metadata editor. Background conversions can take place with this app. One can also customize their own presets. It is an Android OS app and the minimum required Android version is 2.3.3. The app is free but contains a premium package which supports and unlocks more conversion features. It supports conversion to numerous file formats. Easy customization of frequency, bitrate, channel and the start time and duration of format output. Provided with Metadata editing feature. One can customize their own presets. 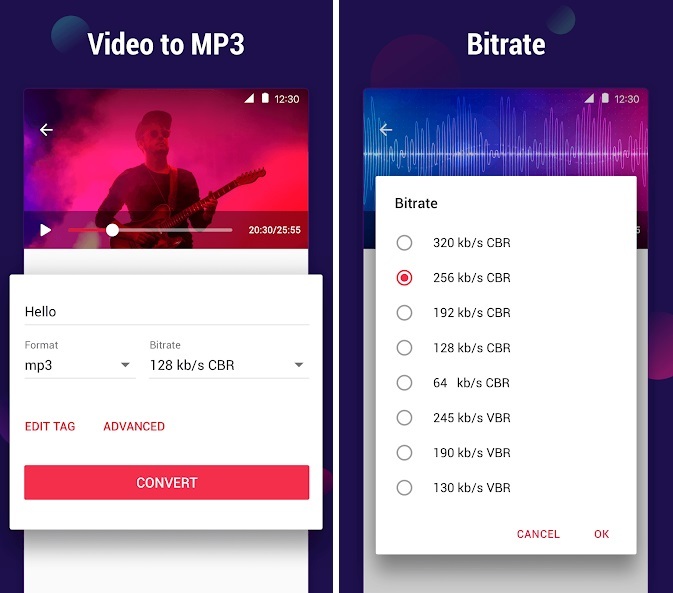 Owing to it awesome features, Media Converter is an MP3 converter app for Android. It has a friendly and easy to configure the user interface. It is a lightweight Android app which incorporates LGPL whereby FFmpeg is used. The app is up-to-date and is updated regularly. It converts to many sorts of file formats including video file formats. With the app, one can chip, cut or extract a section of the audio and use it, for instance like a ringtone. One can also edit, video output using the app. The configuration settings include the ability to change the audio or video bitrate, sample rate, frame rate and resolution. This app requires an Android version 4.0 or higher. Elaborate and concise user interface. It is a small, lightweight and yet comprehensive app that can support many file formats. Has video output editing abilities. One has the ability to change the audio or video bitrate, sample rate, frame rate and resolution. One can use the app to extract audio. Video to MP3 Converter is a free MP3 converter that is cleverly built. The app has a vibrant, sophisticated design with a very easy to use dashboard. The features are classical with inherent masterly execution. 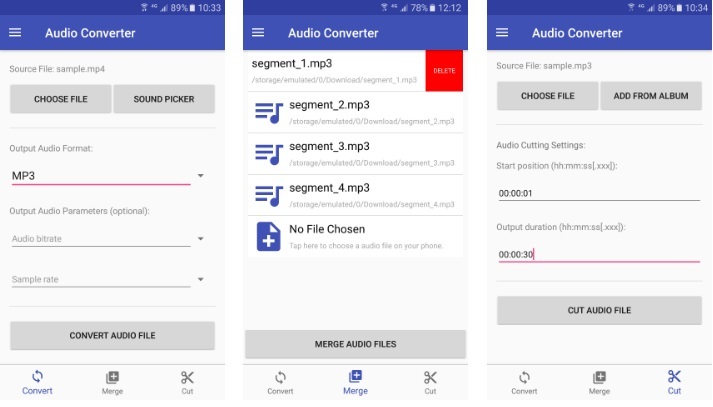 The app enables one to convert to many audio file formats including MP3 and video file formats too. One can use the app to cut and trim video and extract their favorite parts of the video. It also has a sound boost feature. The app supports batch conversion and background conversion too. It is also easy to change the bitrate to the desired limit or level. Video to MP3 Converter has a metadata editor too to assist in editing the information for saving the file output. The app requires an Android version 4.3 or higher. Conversion to numerous file formats. Includes bitrate and sample rate audio output options. Audio and video conversion to many file formats. Easy extracting and merging of files. Feedback on conversion failure(if any). 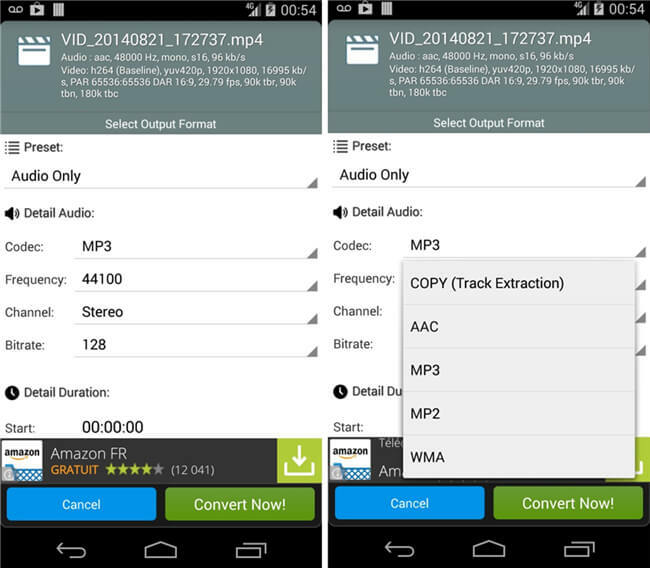 MP3 Video Converter is an MP3 converter app Android. The app’s execution is simplified with a high-performance rate. It utilizes the phone’s processing ability as well as the app’s design and software to convert files. It can convert to many different file formats. Supporting in-app based integration with media player apps, the app is quite smooth in execution. The app supports ARMv7 as well as other higher versions. It utilizes FFmpeg and mp3 lame libraries. The app also has a metadata editor. Utilizes FFmpeg and mp3lame libraries. Includes audio options such as the bitrate. Enables conversion to many file formats. Converting files from and to different file formats is easy and fun using MP3 Video Converter Fundevs. 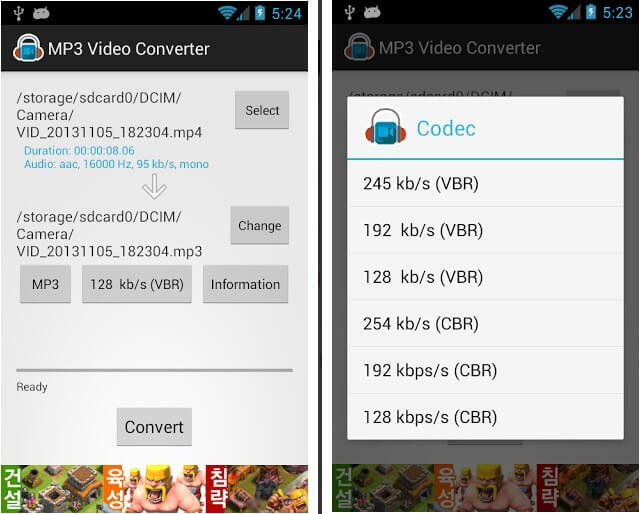 It is an MP3 video converter for Android that enables conversion to many file formats. One can also extract an audio or video from a file using the app. Other features include audio format options for great quality of the output. It has got a Search Field for easier location of files. The app has a meta editor as well. It requires an Android version 4.1 or higher. Easy conversion to multiple file formats. Ability to extract audio and video. Audio format options such as bitrate and sample rate. You can edit metadata information. The app is easy and simple to use. The Fast MP3 Video Converter is a one-of-a-kind application, with exemplary execution. The app is a free MP3 converter for Android devices that is easy to use and from the developer Keerby Applications. The app supports conversion to many file formats. It has audio formatting options such as the ability to change the bitrate, channel or sample rate. Using the app, one can extract video or audios as well. It supports superbly built world-class performance. Ability to convert to many different file formats. Audio formatting options such as the bitrate, channels and sample rate. 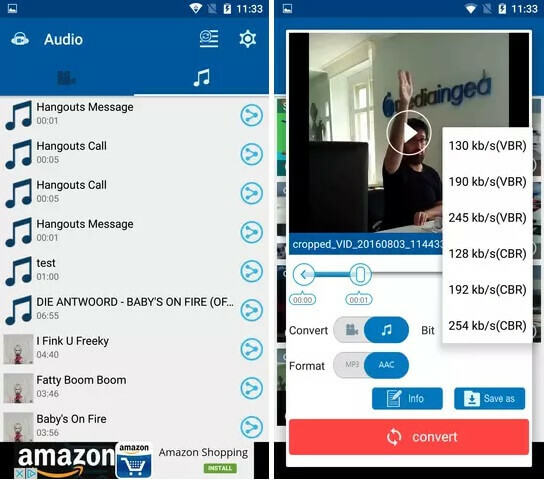 One can extract video and audios using the app. 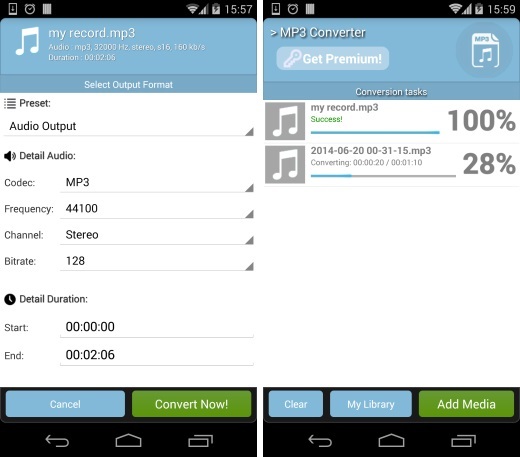 The above-mentioned software are some of the best free MP3 converter apps for Android. They have been tried and their execution is superb. They support conversion to many file formats and have got more great features. Most of the apps are lightweight and work on even very low versions of Android.